Join us for an armchair tour of the Lake Louise area and we’ll explore those majestic mountains, pristine lakes, and powerful waterfalls. 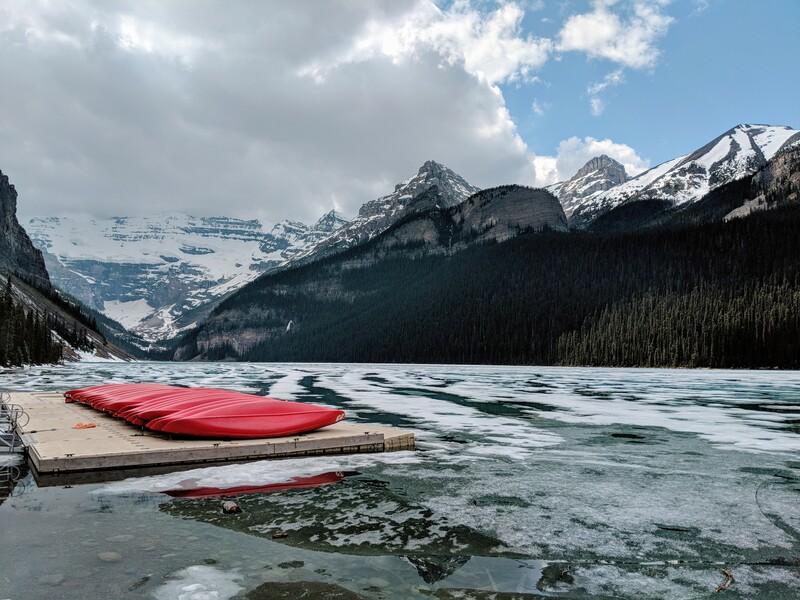 Considering Lake Louise is only a 2 hour drive from our house in Calgary, we really don’t visit there as often as we should! Let me tell you about some amazing things we saw on a recent day-trip to this spectacular area. The first thing you need to know is that Lake Louise is within the Banff National Park so you will need a Canada Park Pass to visit this area.You can get a Discovery Pass that covers Canada’s national parks, national marine conservation areas and national historic sites for a year or you can purchase a Day Admission. Youth age 17 and under get into our national parks and historic sites for free! Let’s talk about sleeping…ahhh, one of my favourite activities! Since we went to Banff the day before, we didn’t want to drive all the way home and all the way back out again the next day so we decided to stay overnight in the back of our mini-van (can’t wait for the day we finally get a REAL RV!!). We stayed overnight at the Taylor Lake rest area but RVs are prohibited from staying there. Fortunately, the Lake Louise Overflow area is only about 2 kms further and when we asked the parking attendant there, he said RVs can stay overnight as long as they want for free! There are no hookups and it’s essentially a gravel parking lot but it looks fairly level and you can’t get much cheaper than free. (Please note, the Parks Canada website says there is a $10.80 cost for staying here so call ahead to make sure). During peak season you can take a free shuttle from this overflow lot into Lake Louise, which is helpful since taking a large RV into that area would either be prohibited or restrictive. Only blocked to traffic heading UP the hill. If you go past the blockade, pull a u-turn, drive back DOWN the hill, they will let you enter. My analysis of this situation is that they don’t want people waiting to make a left turn as that blocks the winding road up to the hotel, so they’d rather have you go past, turn around, and make a right turn instead. go to the hotel and pay to have their private shuttle drive you down to the lake. As you can see, this is very convoluted and one way to avoid all this hassle is to arrive at that turn-off before 7:30am (or even earlier) or wait until much later in the day. 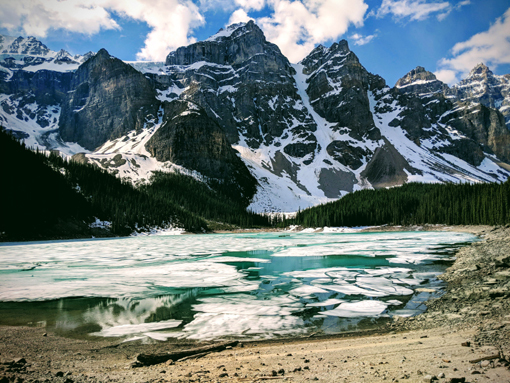 Please note that the road to Moraine Lake is closed in the winter and no RV’s over 20 feet. All that being said Moraine Lake is worth any hassle!! The lake itself is beautiful but the majestic Rocky Mountains towering above is breath-taking. You can walk along one side of the lake and it’s a fairly easy and level path (not wheelchair accessible, though). As with any mountain vista, be prepared for all kinds of weather. We were there in late spring and the lake was still half-frozen, the wind was cold, and there were patches of ice and snow on the pathway. Bring your camera, a snack, sturdy shoes, and water. You can rent canoes and there are hiking trails in the area as well. We will DEFINITELY go back here this summer. We’d love to hear your Lake Louise stories and experiences so please check out our YouTube video and leave your comments there so we can follow along with your journey, too. When I think of Lake Louise, I think of that beautiful pristine lake with a gorgeous hotel at one end and a spectacular mountain and Victoria Glacier at the other. Here we have gone hiking, had tea at 2,135 m (7,005 ft), been snowshoeing, stayed at the Chateau, enjoyed the ice sculptures, and wandered along the meandering lakeside path. No matter what time of year you visit, it is incredibly beautiful. Hiking is as easy or difficult as you want it to be around here. The lakeside path is level, paved, and an easy way to enjoy this serene mountain lake. For more of a challenge, yet do-able, hike veer off and take the Lake Agnes trail which leads to the Tea House (and beyond). Enjoying tea at this elevation is a unique experience and if you prefer, you can ride horses up to the Lake Agnes Tea House. This trail is closed in winter and the tea house has limited hours so do your research before heading up the mountain. Winter in the Rockies is just as spectacular in summer and certainly less crowded! A few trails and locations are closed due to the amount of snow and ice we get, but snowshoeing at Lake Louise will always be a favourite family memory. We also try to make it out to view the entries from the International Ice Carving Competition in January. You can enjoy hot chocolate and adult beverages at the ice bar, take a horse-drawn sleigh along the lakeside, skate on the lake, go skiing, and snowshoeing. As we drove back down the mountain, we decided to take the scenic route back to Calgary. The Bow Valley Parkway (Hwy. 1A) is a much nicer drive than the Trans Canada (Hwy. 1) and you’re more likely to see some sort of wildlife. On this particular day we were really hoping to see a bear but we didn’t actually catch a glimpse of one until we got all the way to Canmore. We did, however, visit with a few deer and a cute little gopher. Wildlife tip: The park rangers have asked that we not stop too close to the wildlife – especially bears – because it will put their lives (and yours!) at risk. As they become accustomed to people, they venture out onto the roadways and they get hit by vehicles. Of course, everyone wants to take advantage of that perfect photo op, so just slow down, have a passenger take photos and carry on. As you drive along the Bow Valley Parkway, you will find many places to pull over and enjoy the views, or park and go for a hike. One of the most popular places to visit is Johnston Canyon. There are two parking lots but, just like everywhere else in Banff National Park, arriving super early in the day will ensure a less crowded and more enjoyable experience. We’ve done this hike in both summer and winter; I honestly can’t decide which I like better! I recommend you try for both, if you can! In winter, you will need ice cleats over your boots and trekking poles are helpful. In the summer the walk to the lower falls is fairly easy and the hike up to the upper falls is a little more work. I’ve still never made it all the way to the “ink pots” but maybe one day I’ll get there. Can you tell we’re not avid hikers? We just enjoy a good view.